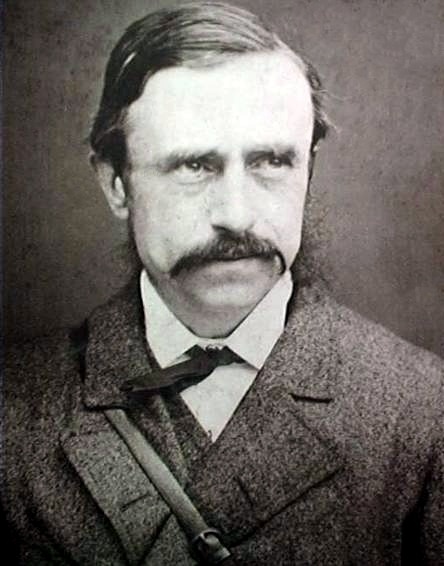 Sir William Boyd Dawkins (1837-1929), was a prominent figure in the development of geology and paleontology in the nineteenth century. He studied Natural Sciences and Classics at Oxford University, and during that time moved to the village of Wookey Hole to study classics with the local vicar, the Rev. J. Williamson. In 1859, when still an undergraduate, he heard that workmen had uncovered the entrance to a cave whilst digging a leat, and were selling bones from it. He led an excavation of the cave, known as The Hyaena Den, and discovered the bones of a large number of Pleistocene fauna including woolly rhinoceros, woolly mammoth, cave lion, cave bear, and reindeer. More importantly, he found signs of human occupation within the deposits, providing important evidence that man was living in the Pleistocene contemporaneously with the megafauna. He wrote a paper on his excavations in 1861 On a Hyæna-Den at Wookey-Hole, near Wells, which was read to a meeting of the Geological Society of London in January 1862 and published in the same year in their Quarterly Journal. A manuscript copy of the paper is held at the Wells and Mendip Museum, where it had been wrongly catalogued by H.E. Balch as being the original excavation notes, and a digitised copy of this manuscript may be found on the Mendip Cave Registry and Archive website. A copy of the paper as published is available on Google books. Other important Boyd Dawkins papers are held at the Buxton Museum, and The University of Manchester Library. More information about The Hyaena Den may be found here.